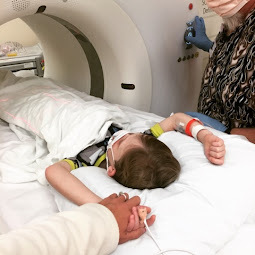 Early this morning, Bennett was admitted to Children's Medical Center in Dallas for a endoscopy and colonoscopy. 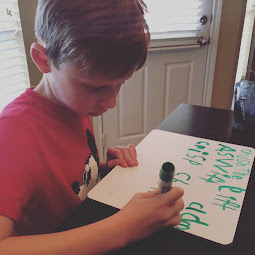 These tests were to explore what might be causing Bennett's concerning GI symptoms and to investigate concerns Bennett might be dealing with an additional diagnosis, Crohn's disease. Of course, for anyone who has endured a colonoscopy, the worst part is not being put under for surgery but not being allowed to eat the day/s prior. The colon cleanout prep we were given started on Monday night at 8pm with a suppository. Then, on Tuesday, Bennett was allowed nothing but clear liquids. By Tuesday afternoon, he had to begin drinking 6 glasses of Gatorade with 1 capful of Miralax each. The day, full of not eating, ended with an evening suppository. I struggled to figure out how to make this as painless as possible for Bennett. Brian and I agreed he would be best to send Bennett to school as it would allow for plenty of distractions and the minimization of food. 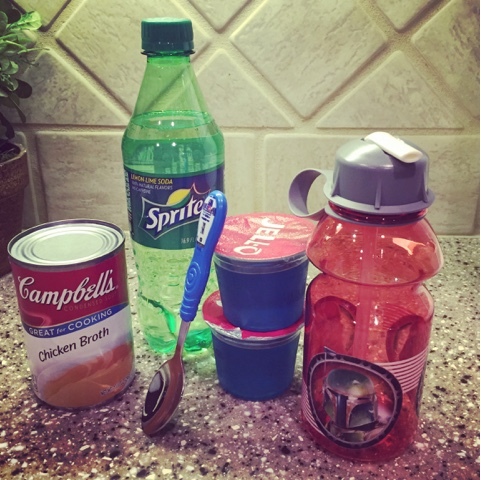 I picked up a new Star Wars spoon for Bennett at Target, with which to eat his Jello, and a new Star Wars water bottle, in which he could drink his clear liquids. Recently I have become aware of how much Bennett loves looking forward to things. He asks all the time when he can get a new toy (to which my reply is often "on your birthday" and "at Christmas"). 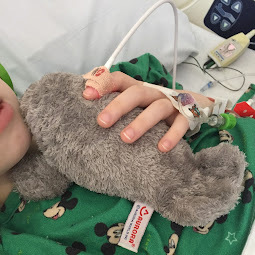 So, once I knew he was going to have to go back to the hospital, I told him to start thinking about which toy he wanted so he could pick it out. We decided to try to help mitigate Bennett's anxiety about not eating and having to go back to the hospital by helping him anticipate a toy he really wanted. 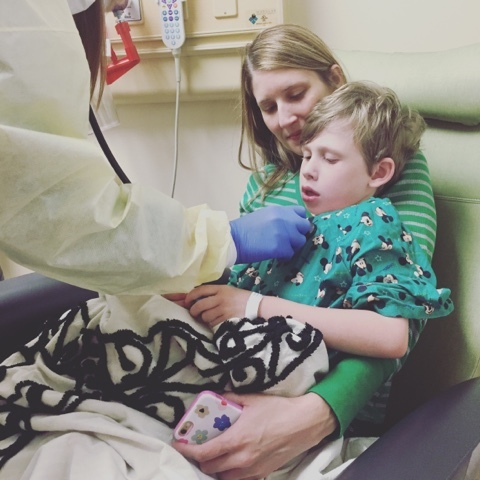 Parenting confession: It's really hard to parent in a non-consumeristic way when your child has a chronic disease and is constantly being poked and prodded. Toys and treats are easy rewards for frequent requests for patient compliance. But, I do try to minimize randomly buying things as much as possible to save his interest in toys and treats for situations such as these. Since we had to be at the hospital so early in the morning, Bennett and I stayed at my sister's house in Dallas. I am thankful for her extra set of hands and support since Brian needed to stay behind with Oliver and Avonlea. Bennett did a really great job with the "colon clean out." It was hard but he did it. He also did well during admitting for his surgical procedure. We were all thankful when it was over. 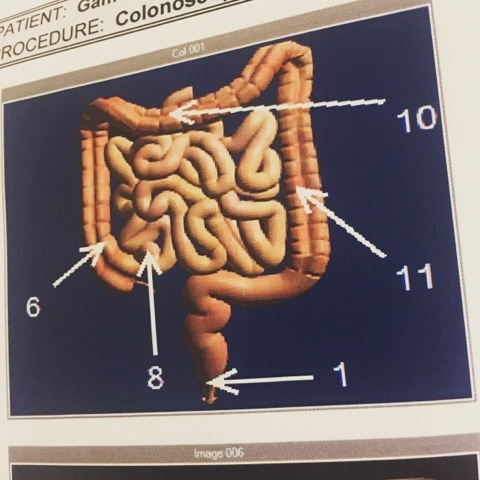 The good news is that upon exploration, the GI doctor was able to better understand Bennett's anatomy to realize that part of the reason his Small Bowel Follow-Through test showed he is dealing with gastric emptying is because part of his colon has been removed (generally the area between #6 and #8 in the picture above). I'll be honest, I don't know enough about Bennett's colon to well explain his anatomy but I can at least explain that Bennett has had several colectomies in his life (removal of small parts of the colon). According to the GI doc, the fact that part of his colon is missing likely explains why Bennett's food goes through his body faster than normal. The doctor said that at some point she would like to add some over the counter medicines to his daily regimen to improve this issue. The bad news is that the GI doctor may have found the reason for Bennett's troubles and, unfortunately, it's going to require more surgical procedures to resolve it. What the doctor found is called an intestinal stricture. 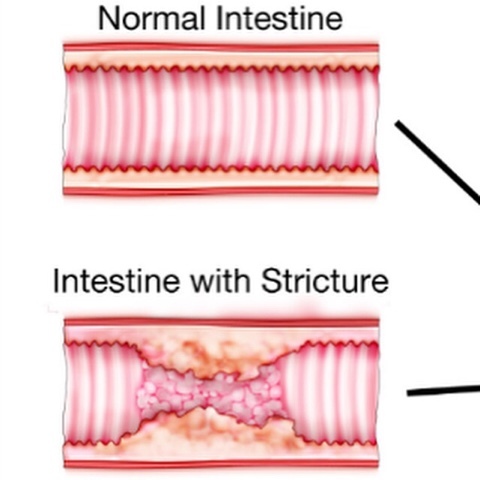 A stricture is a narrowing of the intestine due to scar tissue or inflammation that risks the slowing of bowel movements or blocking them all together. Bennett's stricture is severe. He has only a 6mm hole with which poop can flow. How big is that, you ask? 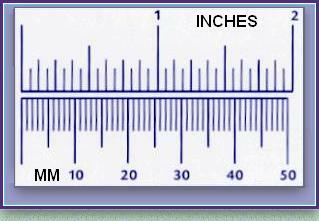 The picture above shows 2 inches. Can you find 6mm? That's how tight the stricture is closing in Bennett's intestine. The GI doctor believes this stricture is what has caused Bennett's rectal pain at times and why he is going to the bathroom all the time. She thinks Bennett can't physically empty his bowels because the hole through which the poop must go doesn't allow him to do that all at once. 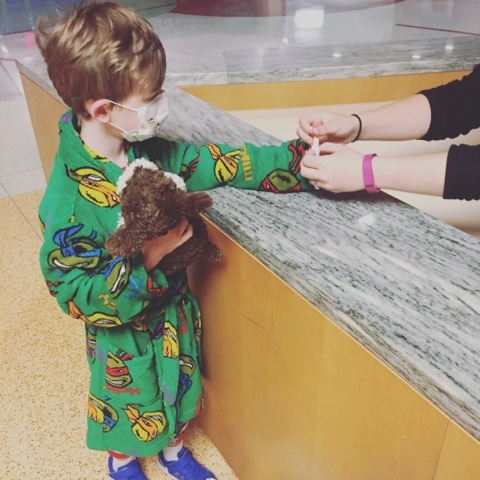 To address this issue, Bennett's GI doc is first going to discuss this issue with Bennett's surgeon at Scott and White as well as with other surgeons at Children's Medical Center in Dallas. But, unless there is a change in protocol, Bennett's GI doc suggests the next course of action will be to use a series of dilation balloons to slowly stretch open the stricture over time. 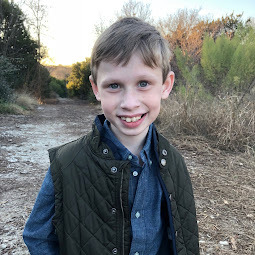 In order to stretch the area appropriately, Bennett will need to undergo this dialation procedure (under anesthesia) every 2-4 weeks for about 6 months until the area is big enough to allow Bennett to have bowel movements normally. If this doesn't address it, we will be forced to go back through surgery. 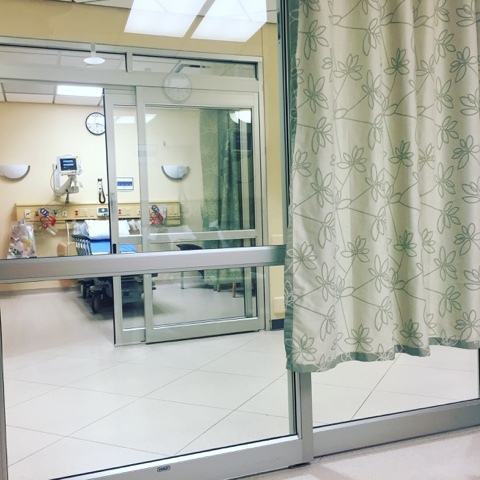 As far as Crohn's goes, the GI doc, from her perspective, feels like the biopsy is likely to come back negative as everything looked good to the naked eye when she was doing the colonoscopy. In addition, she believes we now have all the answers to why Bennett has had so many problems. However, we won't know for sure until the biopsy results come back. What is interesting is that intestinal strictures are common in Crohn's. So, I dunno. Is the stricture from inflammation and scar tissue from previous intestinal surgeries? Or is it one more symptom of underlying Inflammatory Bowel Disease? Hopefully we will know soon. Can somebody let us off this roller coaster?? Oh, Breck and Bennett and the rest of your warrior fam...I have no words. The whole time I was reading this post I just kept praying that surgery wouldn't be mentioned. Bowel/GI issues are so, so dang problematic and painful and never, ever, ever should they affect someone so tiny and innocent as your sweet Bennett. Please know I am genuinely praying for you all and am happy to share more of my experience if that is helpful. Love, love, love you. I"m so sorry, Breck, to read this and know that more surgeries are in store for sweet little Bennett. This path you are on, however, is lined with prayer warriors who are cheering, praying, and surrounding you with love, encouragement, nurture, and concern. We will keep praying and cheering for you, Brian, Bennett, Oliver, and Avonlea. Love you, sweet girl.